Get ready for your mind to be BLOWN. Ours definitely are. We saw this tutorial and knew we had to try this immediately. Too good to be true? Nope. It's real (and safe. read our disclaimer at the end of the post)! Who knew that you could make lipstick out of 2 ingredients? Ahhh! Need. to. make. these. in. every. color. And we would've if we had had more containers. So you will need coconut oil, CRAYOLA crayons, some containers, a pot and a small jar. Must be Crayola. For our containers we just used these guys, they once held a variety of powders but, have all been used up. So we cleaned 'em up real nice and are re-using them! So here's what you do. Once you've cut, the wrapper should just come off like this- so easy! Cut (or break) the crayons into 4 even-ish pieces. Put your jar in the center of a pot and add water to the pot. Make sure you don't get any water in the jar. Add about a teaspoon of coconut oil to the jar and put the pot on the stove. Warm it up slowly, low-medium heat. 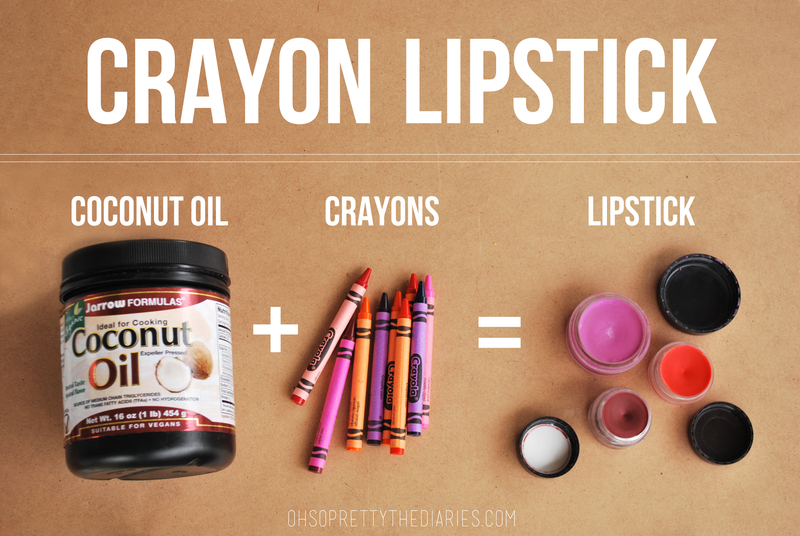 Once the coconut oil has melted all the way, add your crayon. Add a piece of crayon per teaspoon. You can mix colors too, we played around with a bunch of different mixes. If you add too much crayon the lipstick will be a little dry. If you don't have enough crayon, the lipstick will be too sheer and glossier. So it all depends on what you are looking for. And that is that! Get to makin' you some lipstick! ** Some people wonder if this is safe. Most lipsticks are made with petroleum which comes from oil, so think about that for a second. Nasty. Crayons are made for children and are non-toxic. So we think it's safe! OH MY GOODNESS! I must try! This is really neat? I would really love to make some red lipsticks for myself. However, is this at all dangerous for you? I don't know how I feel about potentially ingesting crayons, haha! It's not at all dangerous, since Crayola crayons are made for kids and they can eat them without getting more than a stomachache. Crayons are mostly wax. Wax is already in your lipstick. So cool! Will definitely try this! Oh my wow, this is so amazing!! I am definitely going to try this - I'll blog about it when I do! Thanks for sharing!! will definitely trying this one!!! SUCH a cuute idea guys!! LOVE! I am in love and will be trying to make for Christmas presents! What color are the crayons u used to get those color combos? I love all 3 colors! I would recommend using a natural based crayon made of beeswax and natural based pigments instead of Crayola brand. Something like this brand. And maybe have a look at what Dr Oz has to say about petroleum based lipsticks before making and using your own. Thanks for this tip! We will definitely check this out. Does it TASTE like a crayon?! I swear whoever comes up with this stuff. Crayons are made with regular PARAFFIN wax...same type used in candles. Which when burnt produce toxic fumes. That black stuff that stains walls etc. Not beeswax or soy wax which are both SAFE if consumed internally. Basically paraffin wax being a petroleum by product when heated can become toxic. Therefore this is basically heating up to lift the colorants from the paraffin and bringing up toxins. Much safer idea is to make it with proper safe for consumption waxes and correct skin safe pigments and micas! Even cosmetic companies use beeswax and soy wax. And the statement on it: "crayola crayons are NOT vegan" Where did they get THAT statement? They are not made from any type of tallow or animal products. They are paraffin wax. Which is not an animal product. Color pigments...usually micas which are powder colorants and not extracted from animals or animal derived or tested...and stearic acid which is a component of paraffin wax and is a mineral component that usually is derived from plants etc and nowadays chemically produced and lab made 100% of the time. Stop spreading stupid stuff like this and teach people the right thing please. Lucky for me I have enough knowledge NOT to put the health of my customers and consumers in risk when making 100% natural and authentically vegan and organic products. This...along with the stupid idea of making your own VASELINE lip balms and tints is the most ridiculous and uninformed thing I've ever seen. Just because it works and looks cute it doesn't mean it is SAFE for consumption or healthy! Dang girl. There are a lot better ways to get your point across than the way you just did. Arrogance wins no one over. Your information is great. Your delivery is terrible. I never said anything about crayons being vegan or non-vegan so it'd be pretty hard to take that out of the post. I also said "we think it's safe." I have the right to say that. I'm not putting a gun to anyone's head forcing them to make my crayon lipstick. If you don't think this is safe, then don't make it. How crazy is that. I actually did my research on this so thanks for that tip. There is nothing about this girl's post that was nice or could be taken as non-aggressive. I think petroleum based products are nasty. This is my blog and I have the right to that opinion. It's crazy how the world works like that. If you want to take this idea & make with all-natural crayons, do it. Oh & write a blog about it. What about the paraffin wax used in canning? I never felt threatened by popping that paraffin wax off the jelly and consuming the jelly. And they still sell it for that purpose. If it's dangerous why hasn't it been banned by the FDA? She wasn't arrogant. Maybe she is just angry with people who came up with this idea, beacuse she knows what goes in there. And let's be honest, people see cute, awesome DIY'S on the internet, and they are making it without thinking or reserching. I think it's like going to MCdonalds or not. You choose what you consume. But I get it why is she (Summer) angry, she just trying to make your life better and safer, which is your job to refuse or follow. But you replyed angry as well, how does it sound? Summer did attack (verbally) the whole concept of crayon lipstick. Agree w/ Oh So Pretty.... think it's dangerous/toxic, then don't do it...and Brenda is 100% correct... paraffin wax is not toxic...and routinely used when canning. The "toxins" in candles come from the burning of the wick....so don't set your lips on fire..
Over the years I've found what we commonly think of as 'harmless' and 'inexpensive' materials for crafting are often misleadingly so. Once you start using regular household things on your body especially around eyes and mouth, you've got to take seriously what's in that stuff. The idea to do your own crayon lipstick does sound like a great idea, but that's built on the premise that Crayola is 'non-toxic', meaning under regular use, not going to kill you. There is a reason why Crayolas are cheap and if we were to start melting Beeswax crayons, if we don't already have them in the house, the project is less compelling. Also, the range of colors with Crayola are way more extensive. As for cheap, it's important to look into why they are cheap. if they are mass produced and highly processed, in order to make money on them they must be made from very very cheap ingredients. because of the cost of the labor, capital, etc. that much go into that product. What crayon combination did you use for the beautiful dark reddish color? I'm in love and can't find a lipstick the same color in stores. Would you mind sharing? :) Thanks!!! Yikes, I think what can be a fun project was taken a bit too seriously. While I understand people are concerned about safety, saying that the author needs to "stop spreading stupid stuff like this" is a bit rude. If you're concerned about the ingredients of the crayons used, then just use different crayons instead. With that said, Crayola's website does state that "all Crayola and Silly Putty products have been evaluated by an independent toxicologist and found to contain no known toxic substances in sufficient quantities to be harmful to the human body, even if ingested or inhaled." They do say that melting crayons at high temperatures can produce irritating fumes, so I truly think the only thing you'd need to worry about when doing this project is overheating or burning the crayons when you melt them. I think this is a fun idea and the colors look fabulous (better than some of the actual lipsticks I own)! Just whipped up a batch! Can't wait to see how it turns out when it cools! Can I use beeswax instead of the oil? I have aburn hair that is difficult to find colors that aren't too red! This worked perfectly the fist time. Plus, I used the metallic crayons for extra shine! Ok, I have a few things to say. This DIY is completely harmless & also fun. Whoever "Summer Wilde" is, they've never had boys in their class eat crayons as a child or a pet who accidentally ate one Or a candle. Makeup comes in all different price ranges, but the 3 core ingredients to any lipstick is wax,oils for conditioning,& color. The difference in cost comes from the name & packaging,not ingredients. A Mac lipstick contains the same underlining base as Rimmel. It's no different than Del Monte vs Always Save in canned vegetables. You want that status,so you pay for the more expensive name. Crayons are made out of parrafin wax,same base as canning wax. In fact, there's a video of them being made in a factory. The ingredients are very simple. Yes there are dyes added to make the colors,oh well. 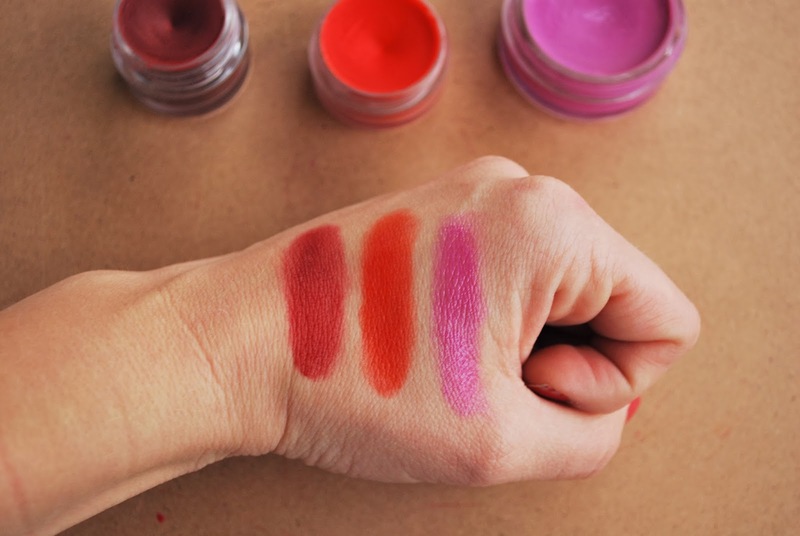 There were dyes added to make makeup you buy in stores. You don't hear of anyone dying or ill from licking their lipstick off accidentally Or intentionally during the day, do you? Or a kid dying bc they ate a crayon,or a whole pack for that matter. It's just digested through, & hopefully a learned lesson. I will be trying this soon..And it can't be any more harmful than that child's play or Halloween makeup that literally smells like Play-Doh the minute you open the package. And the makeup of years gone by was Certainly made with much harsher materials than it is now bc they didn't have the resources we do. It didn't appear to harm either of my grandmothers. I guess another option if people are terrified of crayons near their mouth is to use drops of food dye. It's eaten in cakes,cookies,etc by the millions each year...For decades now. I must try...sometimes we all look for the perfect color or shade of lipsticks and can't find them. This is a great, we can mix and match and create the right tone!!! What flavors can u use so u dont taste crayon? can i use oil pastels for this?